Home HealthFood/Diet The Food Safety Game: A Hamburger Can Cause Paralysis! Having moved away from whole foods for the past many years, fast foods are now a staple in American culture; especially the hamburger. These yummy instant eats have gotten a lot of bad rep in the last few years, primarily for being high in fat and deficient in essential nutrients. But the major problem turns out to be not the artery-clogging saturated fats that we are worried about, but the beef that goes into the making of a hamburger. 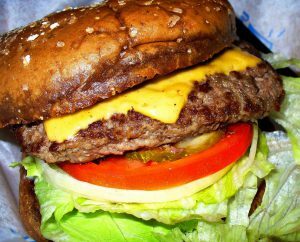 For most hamburger lovers, ground beef is just a chunk of meat cut from a cow and run through a grinder to be made into cutlets. If only things were that simple! The reality of the hamburger can be shocking. The fact is that a single portion of hamburger meat is often a combination of a variety of grades of meat from different parts of cows that mostly are not from the same slaughterhouse. All these mix-and-match combinations make the meat vulnerable to E. coli contamination. In 1994, a new rule barred grocers and meat companies from selling ground beef tainted by the virulent strain of E. coli. An incident at Jack in the Box restaurants where four children died after consuming hamburgers that contained tainted beef led to the formation of this rule. However, even today tens of thousands of people continue to fall sick every year from eating hamburgers made from contaminated meat, sometimes with dangerous consequences, like the unfortunate 22-year-old Stephanie Smith, a children’s dance instructor. A simple hamburger ruined her nervous system and left her paralyzed. Little did Stephanie’s mother know that the beef used in the hamburgers she was grilling for her daughter at home were tainted with E. coli. Starting with stomach cramps and aches, it led to her kidneys shutting down and she was knocked unconscious by seizures. Doctors had to put her in a coma for nine weeks to save her. She finally emerged alive, but paralyzed from waist down. The road ahead is challenging and her kidneys are at high risk of failure. Regaining the basic life skills is now a struggle – all because of eating something she loved since she was a kid. An investigation into the confidential logs and other records at Cargill showed that the their hamburgers were made from beef obtained from different slaughterhouse trimmings in Nebraska, Uruguay and Texas; as well as a mash-like product made from scraps that were ground together at a plant. This summer alone, contamination of ground beef led to its recall from nearly 3,000 grocers in 41 states. Meat companies can reduce the cost of ground beef by almost 25% from using a combination of sources, than they could have if cuts of whole meat were used. These low-grade ingredients are cut from different areas of the cow that have the potential to come in contact with feces, which carries E. coli. What about the testing that is supposed to go into this beef before it is allowed to be used in the making of a hamburger? What testing? As shocking as it may sound, the fact is that, unwritten agreements between companies ensure testing is not done. According to a food safety expert at the University of Minnesota, “Ground beef is not a completely safe product.” Food scientists warn that it only takes a few stray cells of this pathogen to make someone sick, and the federal guidance to ensure meat is cooked thoroughly and to wash up afterward is not enough. The victim of this mushy meat business, Stephanie, was admitted to the hospital in excruciating pain, five days after the family’s Sunday dinner of hamburgers. Dr. Phillip, a pathogen expert says, “I’ve had women tell me that E. coli is more painful than childbirth.” Despite her determination, doctors are of the opinion that she may never be able to walk again. Who would ever think that the seemingly harmless hamburger that we feed our children so affectionately can ruin their lives. This must make you think twice before your next hamburger trip! May be it’s time you started making ground beef at home. Even if it doesn’t taste like the frozen burgers from Cargill, it’s certainly a safer and healthier alternative.